← Using Eggshells as a Slug and Snail Barrier Review — Does it Work? Powder cleanser and a rough sided sponge is often the weapon of choice against built up grime and stains on kitchen and bathroom surfaces. The scouring power of the commercial cleansers is great, but the health hazards are concerning. 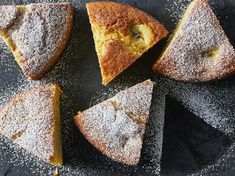 Could a natural homemade scouring powder of baking soda, wetted with white vinegar work just as well? Recently, my husband gave up the diet soda habit (I’m so proud!) and started brewing his own green tea instead. He has an automatic brewer that sits on our counter and sees almost daily use. 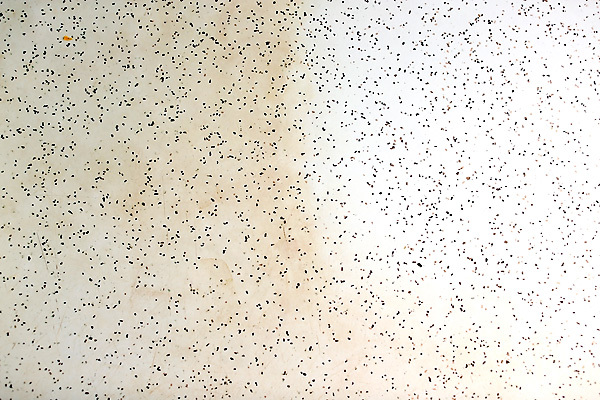 Over time, I’ve noticed tea-colored stains building up on our white “grafix” formica countertop. I decided to try and tackle them naturally. I spritzed the countertop with white vinegar then sprinkled with a layer of baking soda (fizz, fizz). As the bubbles died down, I set to scrubbing with a standard scrubby sponge – the kind with a rough side to it. After a good scour, rinse, and a second round for good measure my counter was bright, and white, and as good as new. All the stains were gone! The natural scouring powder worked! Before and after a baking soda scour. Now you see it, now you don't! For the sake of science, I decided to clean a small section with a big name cleansing powder I happened to have under the sink. As I cleaned with it I noticed several things: 1) it had a little bit of dye in it (this seems completely unnecessary). Either that or it took some of the color out of my sponge (even more concerning). 2) After catching a whiff of it, I felt a burning sensation in my nose, and the back of my throat (yikes!). 3) It took many more rinses to completely clean off – this is especially concerning as I was cleaning a food prep surface. Also, it worked a tiny bit better than the natural stuff. Not a lot better, but enough that you could see the slight difference in white when compared side by side on the same stain. After a few days I noticed the counter cleaned with baking soda was getting dingy faster than the spot cleaned with commercial powder. Overall, I think the natural homemade scouring powder worked well on my countertop. It didn’t work as well as the commercial cleanser. The commercial cleanser, however, left a burning sensation in my throat and a nasty taste in my mouth just from the cleaning fumes. That was enough for me to throw it away. In this case, almost as good cleaning power + no health hazards = WIN! Have you ever tried natural products to get those set in stains out of your kitchen and bathroom surfaces? This entry was posted in Baking Soda to the Rescue, Cleaning, In the Kitchen, The Power of Vinegar and tagged baking soda, better for the earth, better for you, cleaning, cleaning with vinegar, homemade, kitchen, saves money, vinegar. Bookmark the permalink. 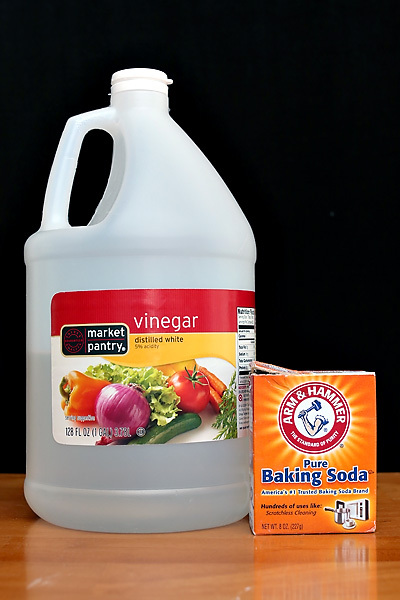 35 Responses to Baking Soda and Vinegar Scouring Powder Review – Does it Work? I love baking soda! I use it for everything. I even use it in my hair. I was recently scrubbing something that not even baking soda or the commercial junk would work on. So I brought out my box of washing soda (I use it to make homemade detergent) and was amazed by how quickly, easily, and beautifully it cleaned and cut the build up of gunk. It is also considered non-toxic. I was so impressed and have added a few more boxes to my cleaning shelf! Hey Jaclyn, thanks for sharing. Can you tell me about the difference between baking soda, and washing soda? Washing soda is NA2CO3 and Baking soda is NaHCO3. that is sodium carbonate and later is sodium bi carbonate which is safer than washing soda. I need to clean our stainless steel sink, and I’ve heard that I should use baking soda. I’m afraid of scratching the sink though. This sounds like it might work nicely! I haven’t tried it on the stainless steel sink yet. Please let us know how it works! I love baking soda for scouring. I always pull it out for stains that won’t go away with just vinegar. For certain applications, I’ve also found that it can be helpful to add a squirt of castile soap. I was having a lot of difficulty cleaning my tub with just baking soda and water. Eventually I read a suggestion to add some castile soap and since then cleaning my tub has been a lot easier. I’m not really sure why it works, but for some reason the combination of the soap and baking soda works a lot better for me than either alone. Great suggestion – thanks Meghan! Oh, and I wanted to add that if you happen to be a Costco member, they sell giant (13.5 lb.!) bags of baking soda. I always get my baking soda there now – it’s even more ridiculously inexpensive than the little boxes! I use baking soda for our shampoo, too, so we go through a ton of the stuff. I love using baking soda to clean everything!! Like the previous commenter, I mix it with a little castille soap to get the REALLY tough stuff. It works like a charm! Thanks for the tip, Jackie! I think it’s time for me to learn more about castille soap. Was the commercial cleanser Comet? It contains chlorine bleach, so it might well have taken some color out of your sponge–I have seen that before with sponges or rags that were colors other than blue. I believe Comet also does contain a blue dye. Not to name names, but it was the other major brand, with added bleach. I think it had a little blue dys, but I was also using a blue sponge, so it’s hard to say… Thanks for the tip on adding a little soap. Several folks have mentioned it, so I’ll be sure to try it out next time. Is there nothing that vinegar and/or baking soda can’t do? Great post! I know, right?! I’ve become a believer! You might try adding a little salt to your baking soda for scouring – I use baking soda and salt to clean my stainless steel sink, and in my opinion it looks BETTER than when I use the commercial scouring powders. As an added plus, it makes it rinse cleaner! That’s a great idea Marcia! I’ll definitely try it out next time! I can’t wait to try this! I hate breathing chemicals while cleaning..! Love it! I tryed making my own and I like your idea better! It doesn’t get much easier than this, Jenifer! Can you use vinegar on granite countertops?? I’ve heard conflicting things. I would love to try this, but am afraid of damaging my counters. I’m not sure, Angie. You may want to try it on an inconspicuous spot first. You will never again eat grapes without doing this. And if you use red seedless grapes, freeze them and be even more amazed. I keep hearing that frozen grapes are a treat — I’ll have to try it soon! Your solution works great in keeping my tub clean and soap-residue free. When you combine an acid like vinegar and a base like baking soda, you basically cancel them out. You have effectively created carbon dioxide ( fizzing) and sodium acetate, which has no cleansing properties. The residual grit in the soda is what is left to clean the surface. This is scientific fact. Use either or, but not a combination.